When an on-screen couple fits together perfectly and oozes charisma, they are suspected to be involved in real life as well. Sometimes it is true (Jon Snow and Ygritte in Game of Thrones), sometimes it is not (Ross and Rachel in Friends). Between Filipino actress, Maine Mendoza, and her on-screen boyfriend, Alden Richards, it wasn't clear if they were together in real life--until one day when Alden gave his blessing to a rumored relationship between Maine and some other guy. The Santa Maria native is popular among the Filipino public as one half of the super couple, AlDub, in GMA variety TV show, Eat Bulaga! Recently, she appeared on a GMA Network comedy series, Daddy's Gurl. At the age of only 23, Maine has amassed a gigantic net worth of over 95 million Philippine Peso, which is equal to almost 2 million US Dollars. On 3 March 1995, Maine was born in Santa Maria, the Philippines as Nicomaine Dei Capili Mendoza to a wealthy family, where both of her parents were successful entrepreneurs. Growing up with her four siblings, two brothers and two sisters, Maine attended St. Paul College of Bocaue for high school and later, De La Salle-College for undergraduate. Maine first entered the world of fame with a Dubsmash video, in which she impersonated famous Filipino actress, Kris Aquino. As she was started to be recognized over the Philippines, she was cast for a segment of popular variety show in the Philippines, Eat Bulaga!. Additionally, she has also appeared in a few other TV shows like Princess in Palace, Daddy’s Gurl, Full House Tonight, etc. She has achieved all this at such a young age before she has even hit her mid-twenties. That is some achievement! Initially, Maine was paired with Alden Richards for a small parody segment in the Eat Bulaga!, but the pair soon became widely popular and turned into a staple of the show. Maine plays Yaya Dub, and Alden her on-screen boyfriend and exaggerated version of himself. Over the years the on-screen partnership of Maine and Alden Richards has won the hearts of many people with their humorous interactions and overall charisma as a boyfriend and girlfriend. They are even referred to as the “phenomenal love team” in the Philippines. Their on-screen chemistry was so charming that the fans started to speculate that Maine and Alden might be together in real life as well. So, what exactly is their relationship out of the show? Read below to find out. Who Is Maine Mendoza's Real Life Boyfriend? In her real life, Maine is a closed person. Fans have to dig through very obscure comments from the related people to find what exactly is going on her real life. However, towards the end of 2018, the rumors started to circulate that Maine has now got a boyfriend, namely Arjo Atayde, a fellow Filipino actor. While neither Maine nor Arjo has commented on the news, Maine’s on-screen boyfriend Alden Richards has given his support to them and has asked all the prying media and fans to leave them alone. From Alden's comment, it is clear that there is nothing between him and Maine, but about if there is anything between her and Arjo, we have yet to hear from either of the parties. Camila Mendes From Dating Non-Actor To Actor Boyfriend - He's Famous! 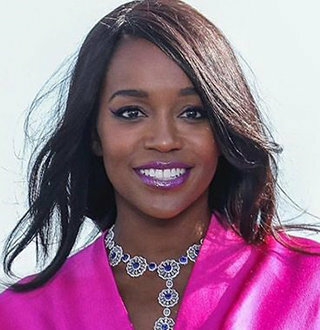 Aja Naomi King Relationship Status Now! Dating "Potter" Star For Real?